To ensure seal integrity and quality control, products that come off the packaging line should undergo regular testing by using package leak detection equipment. Off-line leak detector testing can be done to detect problems with seal integrity to ensure that problems do not go undetected, resulting in unwanted returns, recalls and a damaged reputation for the company. As a result, leak detection equipment is vital to company quality control testing. With off-line leak detection systems, the leak detection process must be performed manually. If the seal integrity of the packaging has been compromised, a sensor in the leak tester will report the results, including the source of the leak. However, if the leak detection system has not detected a leak, the seal integrity is confirmed and the content of the package remains intact and unspoilt. As a result, non-destructive package leak testing can significant reduce costs related to quality control testing for companies. Sealtick has developed several leak detection products that are designed to test the integrity of packaging. These leak detection systems require manual operation. However, they are designed to be quick and highly accurate and they can even be integrated with the company’s existing QA/QC process. 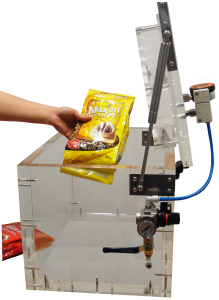 The TSE6089L Flexible Package Integrity Tester offers dry, non-destructive testing for seals in larger food packages. The TSE6081b Flexible Package Integrity Tester offers non-destructive leak testing of larger flexible packages. The TSE6084 Can Integrity Tester tests cans for leaks using a vacuum-decay method for testing tin, cardboard, or composite material cylindrical cans. The TSE2032 Water Bath Integrity Tester uses a vacuum and a submersion testing for the detection of packaging leaks. The TSE6086b Flexible Package Integrity Tester is designed for leak testing of food packages. These systems are based the principle of vacuum decay. To test a package, it is placed under a vacuum, and then isolated. Any leaks will cause a return towards atmospheric pressure. Sealtick leak detection equipment is used companies around the globe to test food packaging for leaks. Sealtick leak detection equipment is easy to operate, safe and will generate results quickly. For over 15 years, Sealtick has provided high quality equipment that are designed to meet the rigorous standards required for commercial vendors and product exports. To learn more about the products that we offer, contact us on 03 9540 5100.